On Thursday I was whisked off on a 3 and a half hour journey to Fermanagh in Northern Ireland thanks to Rachel Dalton Communications. 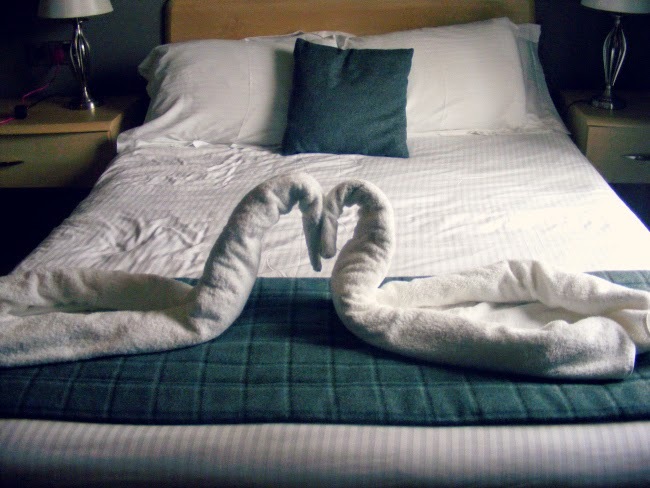 I was lucky enough to receive a night's accommodation in Lusty Beg Island- an exclusive spa paradise. When I first read the email, I have to admit- I squealed a little! I'm so grateful for every opportunity I get, but this one was definitely different to the rest. I was delighted to see some bloggers I recognised also heading up on the coach, as well as journalists, stylists and other members of the press. Not only would accommodation and transport be provided, but we could also make full use of the spa and the activities there. It felt like a bit of a retreat in all honesty, as the island was so tranquil and beautiful. Sounds good, right? Let me tell you, it gets better! I've decided to break my review into small sections so it's easier to understand, so let's get to it! I brought my friend Ciara along and we were delighted to receive a room with a double bed and a single bed, and Ciara was gracious enough to let me have the double. The rooms were extremely spacious and modern, with lovely touches like the swan towels on the bed, and free fruit and water on the desk. We stayed in one of their Courtyard B&B rooms, but they also have lakeside cabins, chalets and lodges- how perfect would that be for a group of friends looking for a few nights away! Thankfully, the beds were extremely comfortable, which was definitely a necessity at the end of our long day. On Thursday afternoon when we first arrived, we were treated to some delicious soup and sandwiches- but it was the 4 course dinner that night that took my breath away. First we arrived at 7pm for pre-drinks in the Thatch Bar overlooking the lake, then we headed into the main restaurant for dinner at 8. 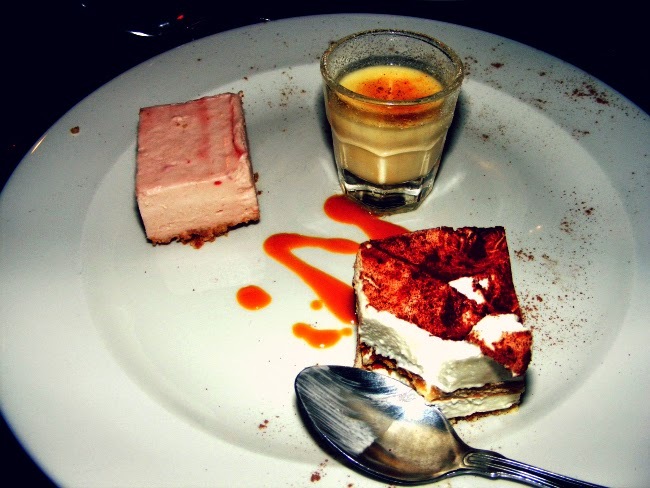 There were four or five long tables and it was great to have Margaret, Laura and Zoë at mine, as we had a brilliant chat.The dinner consisted of confit of duck, roast red pepper & tomato soup, fillet steak and a trio of desserts. It's making me hungry just thinking about it! Breakfast was a buffet consisting of your usual hot food, fruit, cereals, croissants and pancakes- scrumptious! On Friday I was booked in for my facial with Voya after 12, so myself, Ciara and Zoë decided to venture down to the pool before hand. 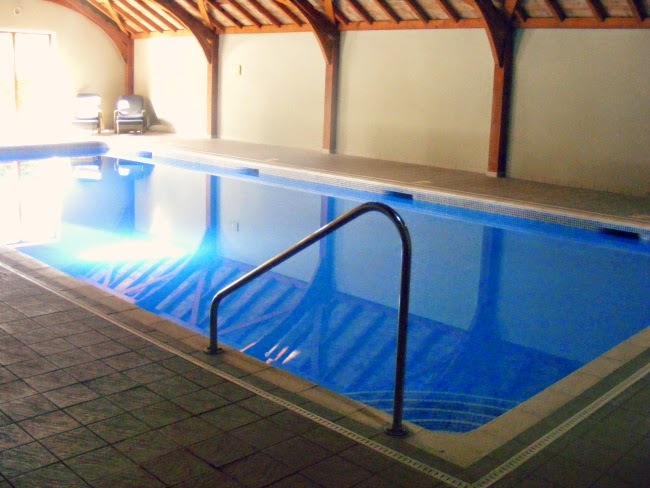 At first, we were the only ones in the swimming pool, which was an added bonus! It was unlike anything I've ever experienced before- the water and air were warm, making it feel very exotic. 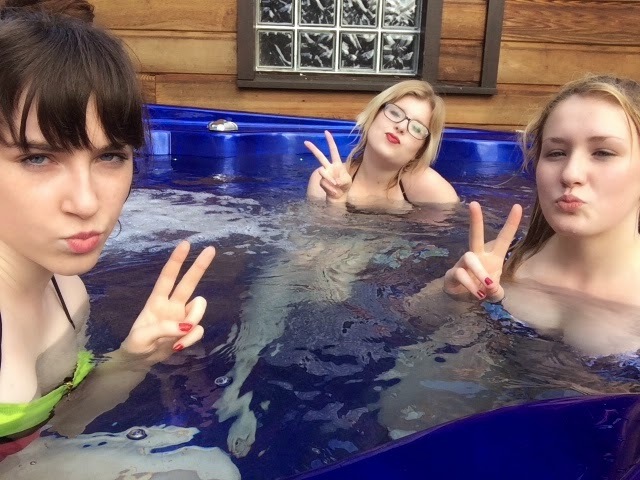 The outdoor hot-tub was simply divine, and we felt very posh in it indeed! When it came to my facial, I wasn't sure what to expect, as Id never had one before- but after this one, I'll definitely be getting one again. I was brought to the relaxation room first before receiving a facial using Voya products. It was so relaxing and I honestly felt so chilled out after it. 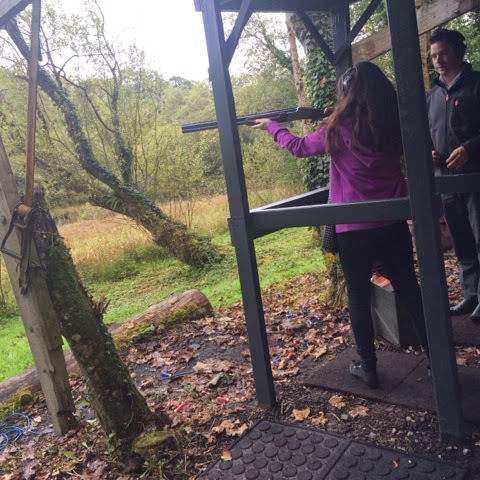 Although the island offers boating, archery and clay pigeon shooting at an added price, Ciara and I only embarked on a trip to the shooting range. I was petrified to shoot a gun, to say the least! I managed to somehow shoot two of the clay pigeons (don't worry, they're not real pigeons, and I'm ashamed to say I thought they were at first- you can only imagine my relief when I heard they weren't!). The shock after the first bullet was released was immense, and the gun was also extremely heavy, so I've a big, round bruise on my arm now. Nevertheless, it was great fun and definitely an experience I'll remember. Overall, my trip to Lusty Beg Island was a fantastic experience and I can't recommend the place enough. The only negative thing I could say about it is that there was no wifi in the rooms- but when you're heading up there for some peace and quiet, perhaps that's actually a good thing! 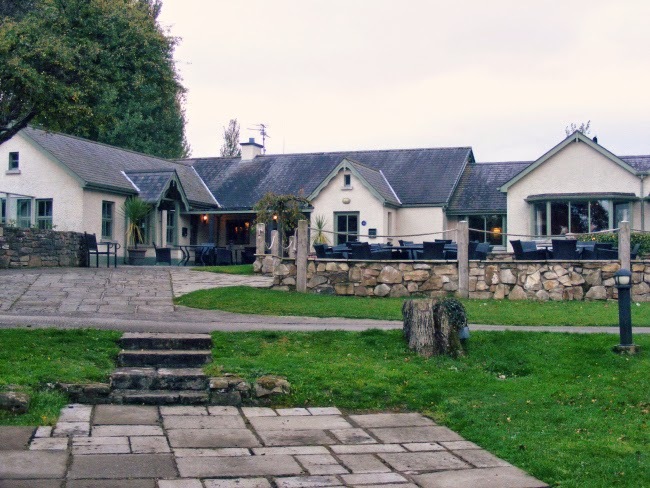 I can't recommend Lusty Beg enough, and it would be a perfect destination for weddings as they can also host civil ceremonies there. I'm so grateful to Rachel Dalton Communications for inviting me too! 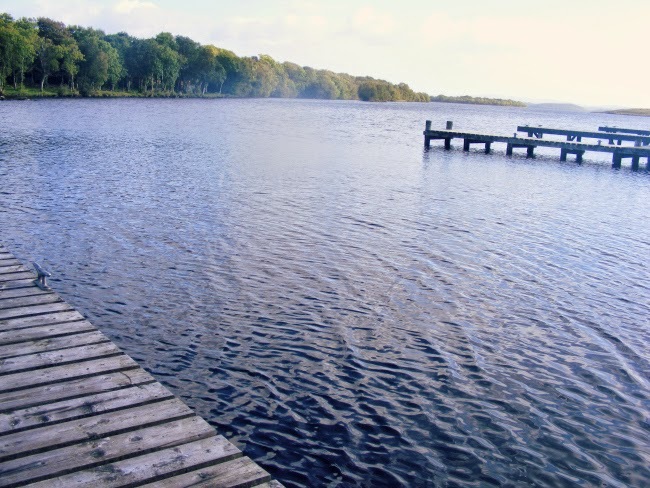 You can find out more about Lusty Beg on their website here. 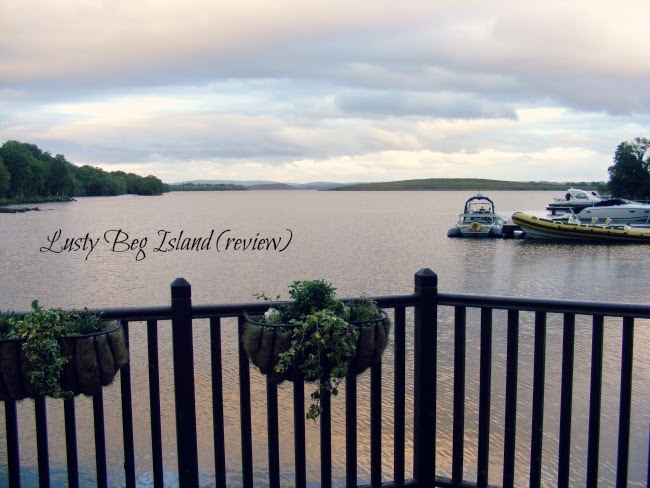 What do you think of Lusty Beg Island*? I'm just back from a lovely two days at Lusty Beg in Fermanagh- and what an amazing fun-filled two days it was! Not only did I get a spa treatment but I also got to do clay pigeon shooting, and was treated to a delicious four course meal and free drinks all night. Life can't get much better than that! I'll have my review of the resort up on my blog in the next few days, and I can't wait to share with you all this gorgeous place. Today's post, however, is a casual outfit that I wore on a relaxing trip to the city today with my family. It was one of those days where I had absolutely no clue what to wear, so dug out this blazer from my mam's wardrobe and coordinated an outfit around it! I thought the cocktails sign was quite fitting as it matched my look, so of course, I just had to pose in front of it. That's the life of a blogger for you! A few weeks ago I was invited to the launch of Boohoo's new Autumn-Winter collection in the Lost Society. I posted my outfit pictures from the event (which you can see here) but accidentally forget to post about the event- oops! Things have been pretty hectic lately, and I've been heading to around 2 events a week- sometimes more! September is the time for collection launches, and it coincidentally happens to be the start of the school year- not cool! I always see people wearing amazing pieces from Boohoo, but I'm not a big online shopper myself- I think it's time that changed. I was highly impressed by the collection, and everything was right up my street. There was tartan galore (no surprise, but I adore it! ), shimmering sequins for the Christmas party girl, and lots of faux fur. From blue to pink to black, there's no need to stick to the old teddy brown coloured fur anymore! It was also a pleasant surprise to be welcomed by a lot of pastel shades this Autumn. Over the past few years, pastels have been typically associated with Spring, but Boohoo have broken the rules. And I love it! One of my most loved pieces from the collection has got to be the blue stripey faux fur coat that I tried on in the picture below- it's so unique and beautiful. See anything you like? What are you looking forward to wearing this season? p.s- I'm being escorted to a spa resort in Northern Ireland tomorrow so make sure to follow my instagram/twitter for updates! I'll be reviewing my stay there when I get home. 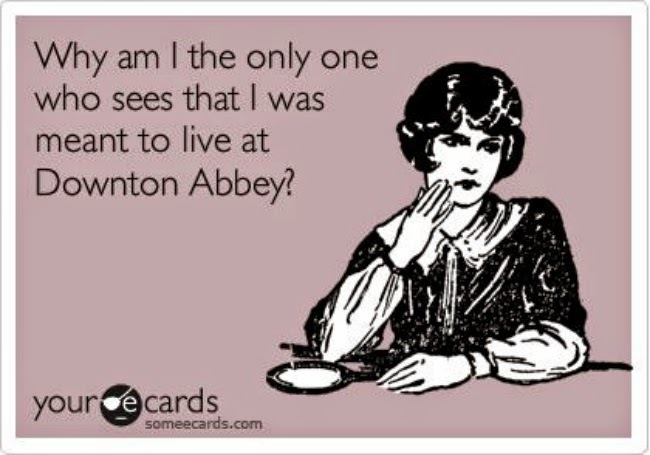 It has come to my attention lately that I am ridiculously obsessed with the British TV show, Downton Abbey. 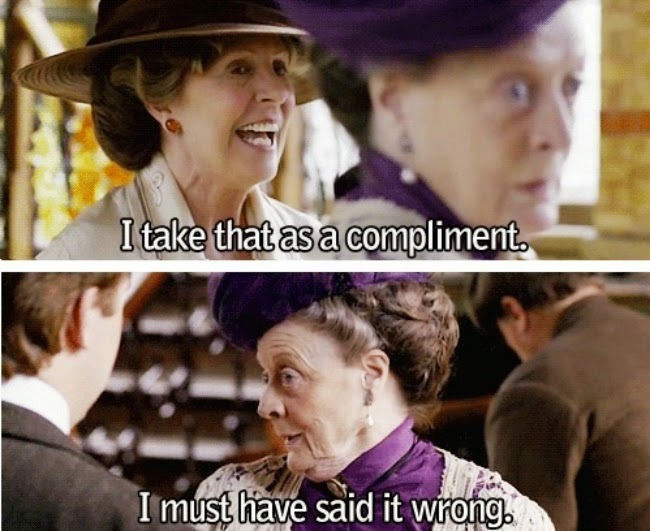 My love affair for Downton began this Summer, when I spontaneously decided I'd try watching an episode. Which led to 2 more episodes. Which led to all 4 seasons. 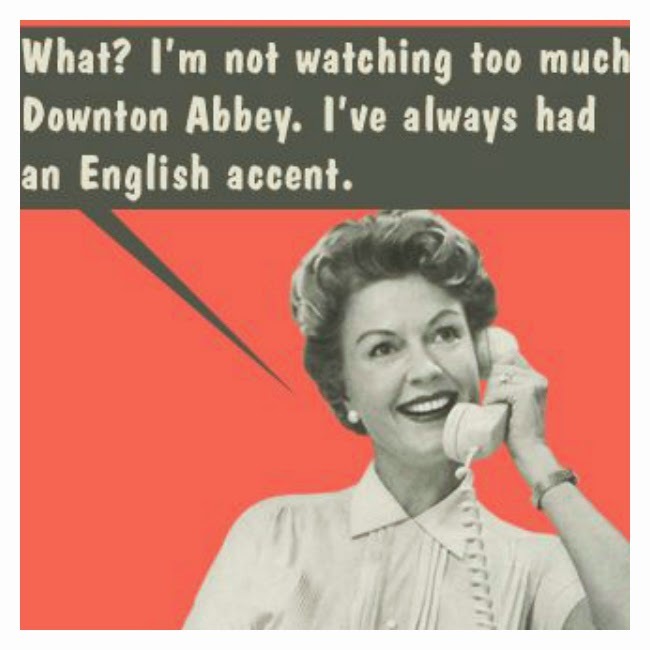 My entire Summer summed up in one word is: Downton. Now that season five has just begun, I've decided to throw together a little humorous post (in the most serious way) about what it is about Downton that makes me so excited when the renowned theme song begins every Sunday. Ok, this one is a bit of a predictable one- I am a fashion blogger, after all! And even though I admit that Mary's wardrobe can be a tad drab, there's something about the female characters' clothes that makes me weak to the knees. If I could pull off a beaded drop-waist dress every day, I'd totally wear one. I also find it fascinating to see the evolution of their wardrobe as time progresses- from pre-World War I full-length gowns, to the flapper dresses from the roaring twenties worn in the most recent episodes. That's my Halloween costume sorted! There's no denying that some of the male characters on Downton are extremely handsome, even if some of them have died along the way.. Perhaps Tom doesn't bring out the best in Irish people (we're not all part of the IRA!) I still wouldn't say no if he came knocking on my door! I loved Maggie Smith in Harry Potter, and by god do I love her even more in this. Her one liners never fail to make me burst out laughing, and she's so witty and sarcastic- I adore her! The Dowager definitely adds a bit of humour to the historical series, but she can also be extremely kindhearted and understanding. I have noticed she seems to wear the same purple dress all the time, but sure when you've got that much sass, who cares? 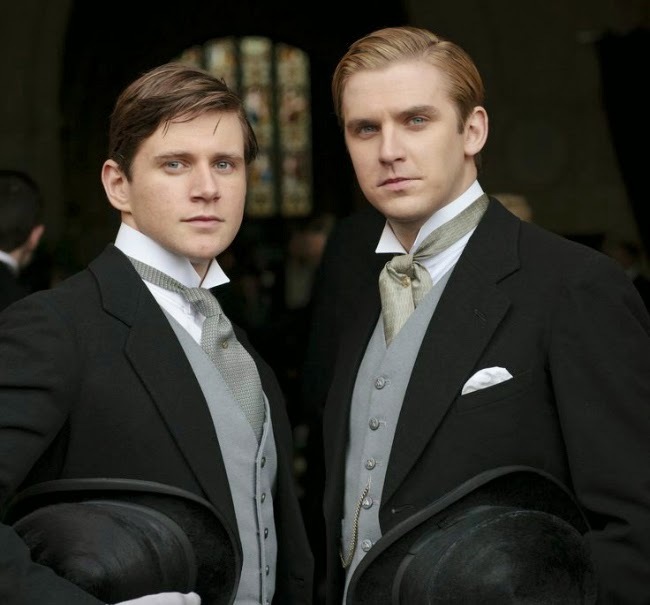 Each week at Downton Abbey brings something new, whether it's a death, birth, marriage or proposal- and I love it. A lot of it is completely unrealistic but on a Sunday night, there's nothing I want more than an escape from the idea of a Monday morning looming ahead. 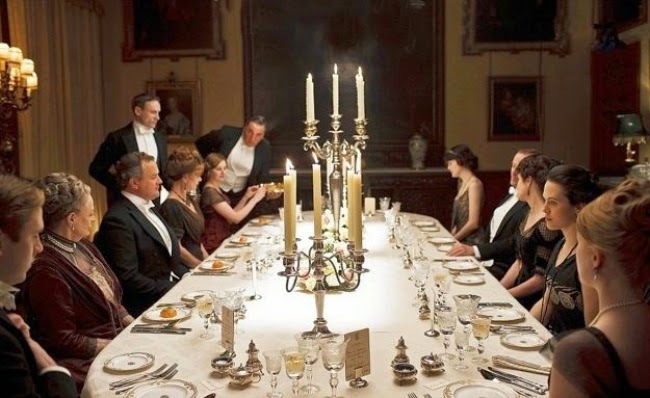 Not even that, but the simple things in their life make me wish I lived in the 1920's- luncheon on Saturday in the drawing room, or a trip to London to stay with Aunt Rosamund- can life get any better than that? So there you have it! A bit of an odd post for a Monday, but an insight into my crazy obsession with Downton Abbey all the same. Are you a fan of Downton? What do you like about it? London Fashion Week came to an end this week and I'd been keeping up with all the shows during the weekend, so I decided to put together my favourite shows/looks for you all! I love fashion week- whether it's London, New York, Paris- wherever. One of my goals in life is to attend all of them in one year.. Ambitious, I know! I'm secretly hoping to get to LFW next February as it would be perfect timing after my mock exams, but I'll definitely have to stat putting by some money now if I am. I know fashion week isn't for everyone, but even the idea of it makes me smile. The eccentric streetstyle, celeb spotting, and of course, the endless list of designers showcasing their work- it can't get much better than that. For now, I'm stuck with watching the shows online! Ashish, by Ashish Gupta, is a favourite among bloggers for it's quirky past collections. This season was no different! There was quite a sporty vibe with loose shapes, and some late 80's inspiration can be seen in the oversized denim, like the look on the left. There were sequins galore, and the fluffy shoes are super Clueless-esque- love love love! 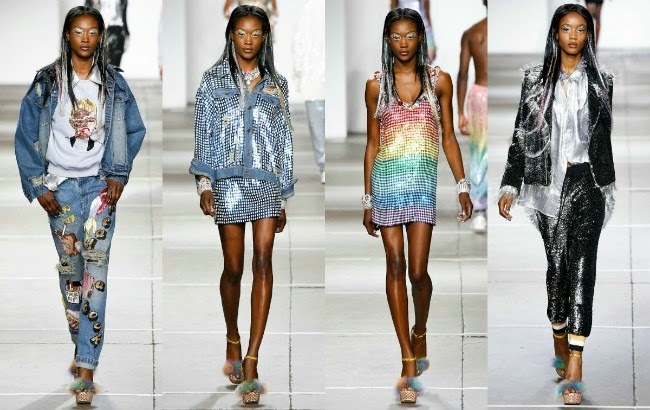 Ashish are definitely not for the quiet, as this collection shouts glitter and bold colours. Before this season, Felder Felder weren't really a brand I had much interest in, nor had I heard a lot about them. However, after this beautiful S/S collection, I'll definitely be keeping an eye out for them in the future. Not only were the pieces extremely gorgeous, but all the leather pieces were actually faux leather! It's always nice to see designers stray away from using real animal furs/skins, as it's quite a taboo subject in the fashion industry. Fringe, metallics, faux leather and cowboy boots- what more could you want? I first discovered Julien through his collections for Debenhams as a child, but his runway collections are definitely a big leap from the department store items! 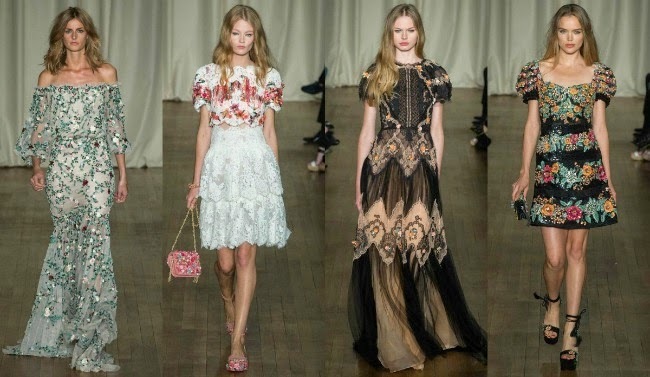 This collection was definitely more of the conservative ones for S/S'15, but the dresses were beautiful. The patterns were so intricate and I could definitely see myself wearing one of them for a wedding or special event. The dresses were very structured, and sleek but as you can see above they are just so ladylike and lovely! Oh, Marchesa. One of absolute favourite collections this season- I adored every piece. There was a strong 70's vibe throughout, and the floral applique screams 'fairtytale' to me. I read a comment that said it was like 'rock-n roll gypsy fashion' and I couldn't agree more- that sentence just sums up the entire collection! Everything was super romantic and free looking, and I could imagine myself running through the fields of Oz in that dress on the left- no lie. Sibling are another brand I'll admit I'd never really noticed before, but what can I say- wow! I love mixing textures, and that's what this whole collection was all about. 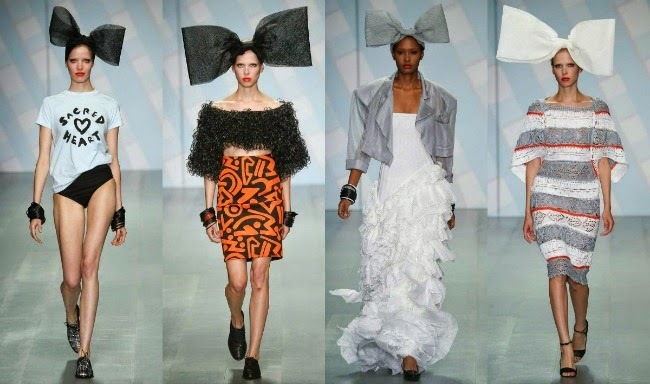 The oversized bows add a bit of whimsicality to the catwalk, and the slogan tees are very urban and modern. This was overall a very brave and fun collection and I applaud Sibling's Joe Bates for that. The second look on the left is something I'll definitely be taking inspiration for next Spring! Overall, it seems a lot of brands decided to take a fun twist on Spring/Summer fashion for next year, and it was refreshing to see some of them move away from pastels and floral prints. ("Florals? For Spring? Groundbreaking.."). I was super excited to see metallics make a return, and I'm also loving the floral applique look. Roll on Spring 2015! Today's post is quite short and sweet, but I thought I'd share with you these beautiful blue nails I wore last week (yes, I do realise the title of this post is actually a bit of a white lie..). I recently received the new Max Factor gel shine lacquer collection* in the post and I was super excited as the theme is 'modern glamour'. The collection features some fabulous 1950's reds, 70's blues, 80s brights and 90s shades of burgundy for a bit of grunge. As I'm sure you all know by now, I am a BIG vintage fan! The shade I'm wearing in pictures is 'glazed cobalt*'- a perfectly glamorous cobalt blue. I absolutely loved the shine and vibrance from these polishes, but I must admit I was quite disappointed with the longevity. Even with a top coat, they chipped after a day! Perfect for nail art or those who change their nails regularly, but this polish does not score high on the long wearing nails scale, especially as it's supposed to be a 'gel like' nail polish. For the lovely packaging and shades though, the €10.99 can almost be justified. Almost. Are you a Max Factor fan? What have you been wearing on your nails lately? 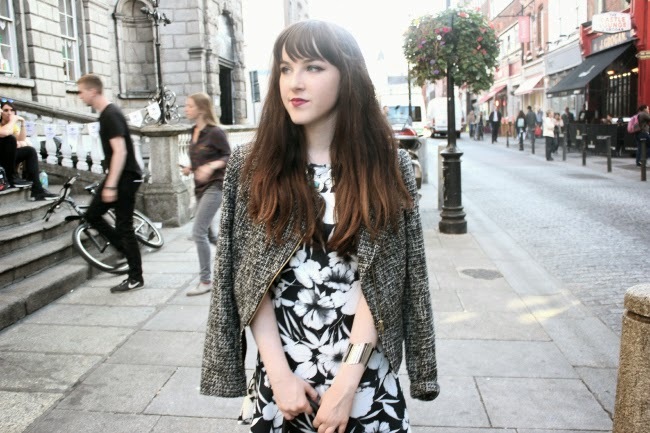 While at the Boohoo event last week, my friend Zoë took these insanely fab outfit pictures for me. I felt very professional indeed! You might recognise some of the pieces I'm wearing from my latest haul here, and it just shows that you don't need a lot of money to look or feel good. I'm all about bargain hunting! I'm currently writing this post with wet nails, which probably isn't the best of ideas.. Speaking of nails, I haven't really been feeling the 'beauty blog vibes' lately. I find a lot of them quite repetitive to read and prefer writing fashion posts! That said, I do still love nail art and makeup, so you won't be seeing the end of beauty here on Oh Hey There Rachel- maybe just more fashion! Do you have a certain outfit that just makes you feel wonderful while wearing it? First of all, I can't believe it's been 5 days since I last posted! This week has been so hectic with events and homework deadlines, so I really need to try manage everything a little bit better! I recently popped into Penneys for a much needed shopping trip. Do you ever get those days when you're just itching to brows the rails? Well, it was certainly one of those days- so myself and my mam headed to Penneys to check out the new stock. I picked up a good few bits for way under €50- bargain! I have a new outfit post coming up soon in which I'm wearing a few of the items, so stay tuned! Unfortunately, Ireland seems to be a bit muddled with the weather lately- it was roasting out today, so I might have to wait a week or two before digging out the more warmer pieces. Excuse the image quality- it was a pretty dark and dismal day when I took them! Grey boots- €18 Every year I buy a new pair of Winter boots, and these pair are practically stylish and ridiculously low priced! Cleated soles and chunky heels make up most of my shoe-drobe, but I actually have never owned a grey pair of shoes before. This is a refreshing change! Blanket scarf- €7: The 'blanket scarf' was first seen by Burberry this season, and it's a trend I've fallen in love with. I absolutely adore the red tartan (which is making another comeback) but it' also reversible! The other side is monochrome houndstooth print. It's also super cozy! Silver cuff- €3; This was a bit of a last minute purchase but I thought it would look perfect with an outfit I was planning. It's a bit of an awkward fit on my arm but for the price, what's not to love? 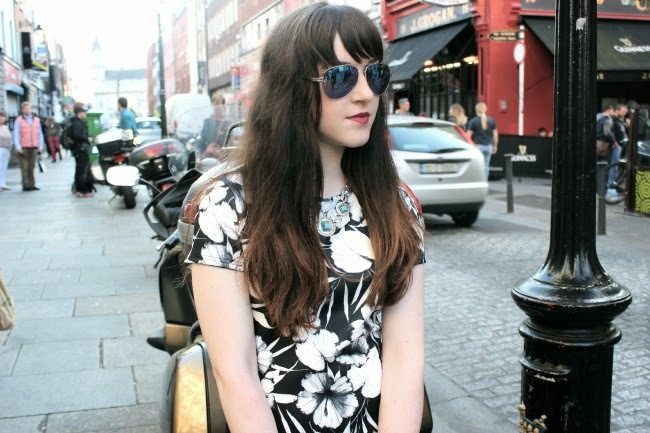 Peplum floral dress- €7: My favourite bargain from the haul is definitely this beautiful black and white dress- €7! The bottom-peplum was really popular recently so although I'm late to the trend, it's such a wearable dress with so many different styling possibilities. Gingham skirt- €9; Last but not least, another monochrome piece! After I purchased this skirt, I noticed that gingham appeared on numerous catwalks at New York Fashion Week this season! This skirt is super flattering and it would look great with a bright pop of colour in the form of a sweater or a jacket. So there you have it! See anything you like? 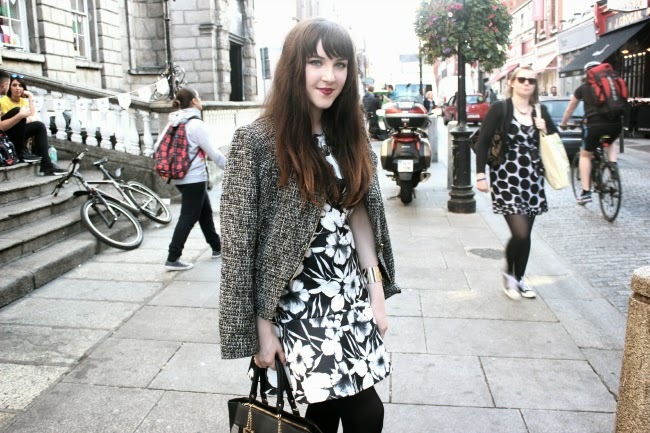 Have you picked up anything from Penneys/Primark lately? As mentioned in my last post, I was lucky enough to be invited to the Warehouse A/W'14 press preview. In the past, Warehouse have been a brand I'd seen a lot of people wearing but never really shopped there myself. After seeing the new collection, I can definitely see myself shopping there soon! The preview of their Autumn/Winter collection was held in their store on South King Street in Dublin, and it was such an intimate event but I really enjoyed it. There were breakfast goodies, and of course- beautiful clothes galore! The clothes were separated by category, and the first rail I noticed was where the sparkles were, typical me! They were some fabulous evening and daytime pieces made from a loose, glitzy material. The 1960's are back with a bang this season, and it's clear that Warehouse took inspiration from the era. Square shapes are a big contender this season without doubt, but they can also look really feminine! I also noticed how the colour red appeared to be quite popular, so I'll definitely have to try out a few pieces. Also, fear not- the two piece is here to stay! Why not try it with a knitted sweater and matching skirt? Mixed textures like wool, leather and faux fur are going to popular this Autumn. There were a lot of bright colours and bold prints for the daring, but also some gorgeous pastel and grey pieces too- definitely something for everyone! I was so so impressed by Warehouse, and can't wait for the collection to be released so I can go buy it all.. Especially since everything is so reasonably priced too! Will you be popping into Warehouse for some Winter shopping?